Garlic Bread Pasta | Yup, It's Vegan! This post is sponsored by House Foods. As always, all content is my own. Sponsors allow me to keep bringing you new recipes like this Vegan Garlic Bread Pasta! A few months ago, I saw something on the internet that sounded really delicious. It was called Garlic Bread Pasta and it was made by taking pasta and covering it with toasted breadcrumbs and almost an entire stick of butter. That recipe was beyond the reaches of what I’d normally even attempt to veganize or make healthier. Nevertheless, the idea of it stuck with me. Capturing the flavors of garlic bread is a very nostalgic thing for me and it stayed with me as strongly as any wild rice soup craving. Fast forward to Thanksgiving 2017, when House Foods asked me to create a comfort food inspired recipe using their delicious tofu shirataki noodles. I’ve written about shirataki noodles once before. 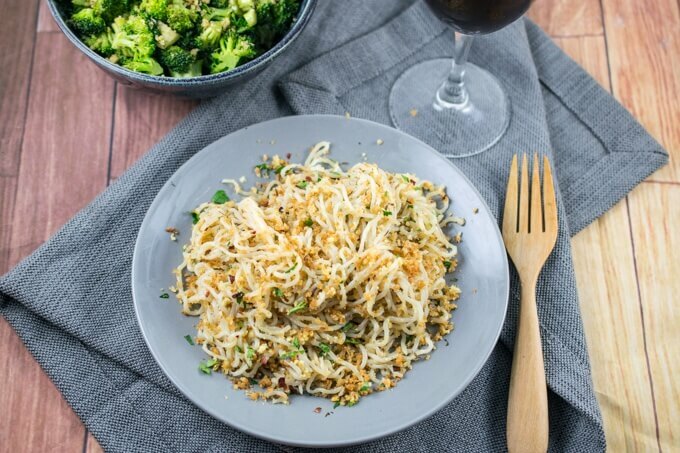 They’re a grain-free, almost calorie-free, low-carb alternative to traditional noodles. They’re a little more slippery and chewy than “regular” pasta but tasty in their own right and fun to experiment with! 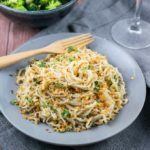 With the idea of a vegan garlic bread pasta in the back of my mind, I realized that using shirataki noodles could be a wonderful way to make the dish lighter, and pare it down from 2 different breadlike ingredients to only one. Garnish with parsley, red pepper flakes, and vegan parmesan if desired! I hope you enjoy this slightly lighter twist on a comforting dish! 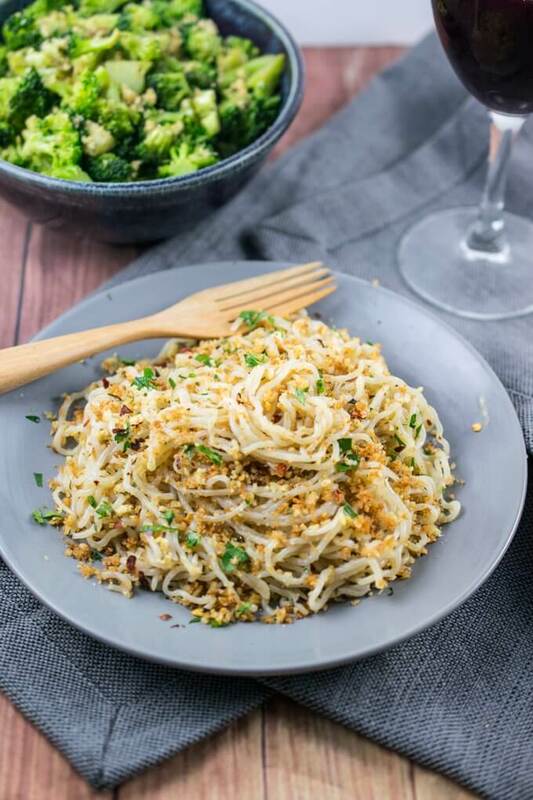 Shirataki spaghetti is tossed with a garlic olive oil sauce and crispy toasted breadcrumbs for a quick, easy, lightened-up take on the flavors of garlic bread! Gluten-free and grain-free options. Open the shirataki spaghetti package and drain and rinse the noodles well. Using kitchen shears to snip them in half or thirds. Add the spaghetti to a microwave-safe bowl and cook for 2 minutes on high. Drain the noodles again, then return them to the microwave and cook for another 3 minutes. Drain a final time if necessary, and set aside. In a skillet, warm the olive oil and coconut oil together over medium-low heat. Add the garlic and cook for about 3 minutes, or until fragrant and softened. Mix together the breadcrumbs, nutritional yeast, salt, garlic powder, dried herbs, and black pepper. Turn the skillet heat up to medium and add the breadcrumbs, stirring vigorously to combine them with the garlic and oil. Continue to cook, stirring frequently, until the breadcrumbs are evenly browned throughout, 3 to 5 minutes. 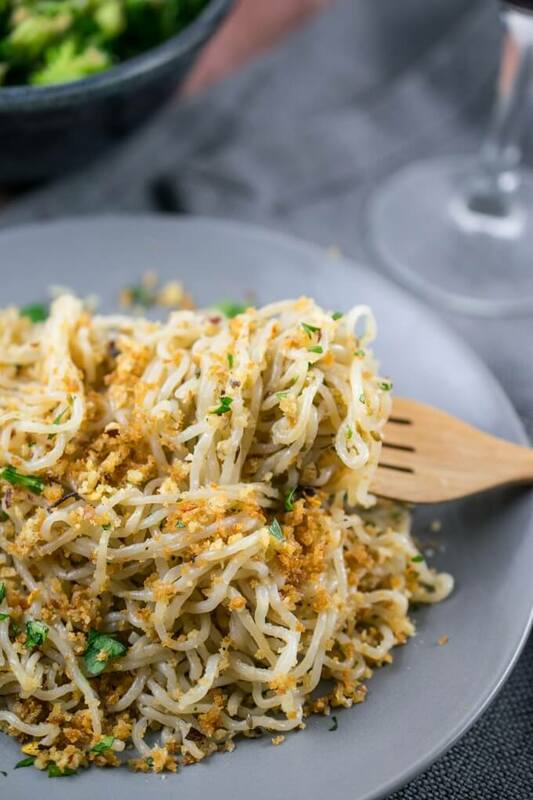 Add the lemon juice and the shirataki noodles to the pan and use tongs or a stirring fork to combine the breadcrumbs mixture and pasta together. Cook for 2 minutes more. Serve immediately, garnished with fresh herbs, red pepper flakes, and vegan parmesan if desired. GRAIN-FREE: Substitute the breadcrumbs with coarsely-ground walnuts. Use 2 teaspoons of olive oil and omit the coconut oil. MICROWAVE ALTERNATIVE: Boil the noodles for 10 minutes, then drain them and pat them dry before proceeding to step 2. 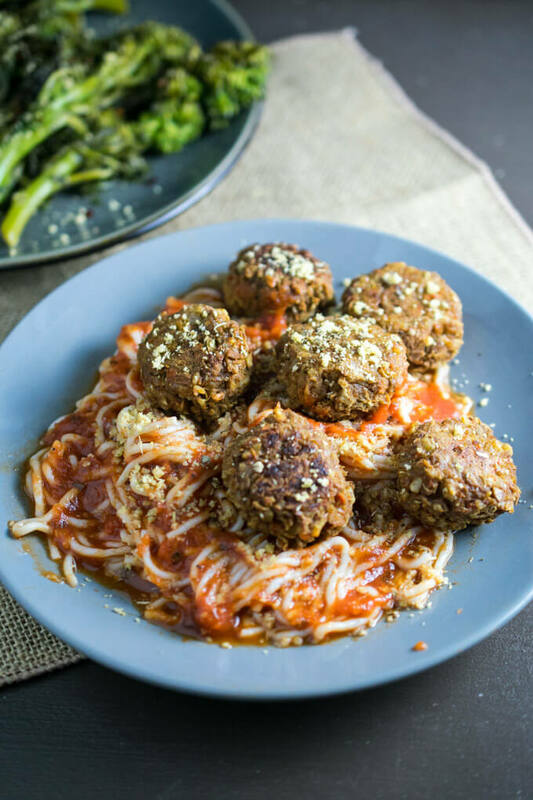 For another shirataki noodle recipe, check out my Spaghetti and Lentil Balls! Looks so beautiful & appetizing ! !